As foam mattresses become more and more popular in the United States, there have been a number of developments in the industry. Producers have tried to create and use as many different materials as possible to provide the best night’s sleep. Before recently, foam mattresses were hard to find for an affordable price, ones that were cheap were often low quality. People who were against using foam mattresses often cited the inability of the mattress to maintain its shape over a prolonged period of time. Sleep On Latex has taken things to the next level – they manufacture their products using latex exclusively. Latex has a lot of the same qualities as regular memory foams, but with some added benefits too. In this review, we will explore the Sleep On Latex mattress and determine if it’s the perfect mattress for you. Make sure to take in all the information in this article – a mattress is one of the most important investments you’ll make in your home. Should I Buy the Sleep On Latex Mattress? The Sleep On Latex mattress has been made using only latex and wool. It has three separate layers which differentiate themselves through their support and comfort levels. Latex might sound like a strange material to use to make a mattress, but if you try the Sleep On Latex mattress you will see how well it works! We will discuss each layer in more depth below. Top – This is the wool layer of the mattress, it is 1” thick. It provides a nice, soft point of contact for when you first lie on the mattress. While this layer is extremely comfortable, comfort isn’t actually why it’s there. It prevents heat from moving into the latex – as latex tends to absorb heat. Middle – This layer is made from a signature Dunlop latex, it is 2” thick. 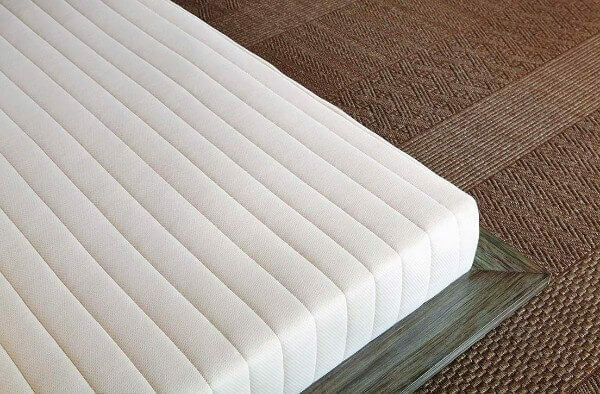 This part of the mattress provides a soft, comfortable layer for the person who sleeps on the bed. It also ensures a smooth transition to the support layer. Bottom – This layer is also made from Dunlop latex, except it has higher density. This layer is 6” thick – it provides all the support and foundation needed. The mattress is 9” thick in total, which is just below average for foam or latex mattresses. 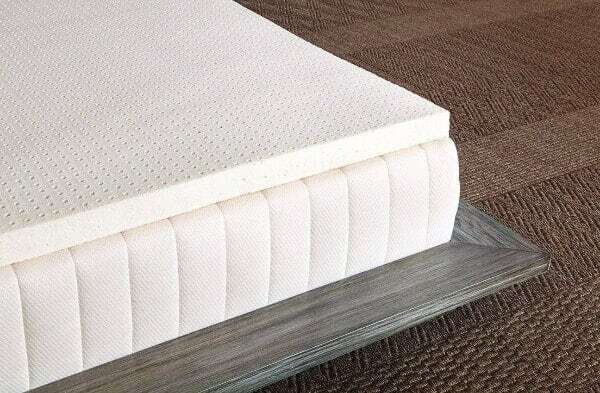 This being said, every inch of the mattress is used effectively and creates an awesome product. Sleep On Latex takes a bit of a different approach with their cover. Instead of using artificial materials like many modern foam and latex manufacturers do, Sleep On Latex uses organic cotton to make their covers. They also quilt in a layer of wool in the top of the cover to provide additional softness. This type of cover has its advantages and disadvantages. You’ll find that the material tends to trap more heat in it than it would if it were made from polyester or a similar material. This can be a bit of a pain for those who overheat easily while they sleep. In addition, the wool at the top of the mattress also tends to aide in trapping heat as the mattress becomes less breathable. The problem is that latex and foam trap heat much more readily than spring or coil mattresses, this is because there is no room for air to flow through – the cover on the Sleep On Latex doesn’t help this problem. On the other hand, the organic cotton and wool is much less flammable than polyester or other traditional cover materials. Considering how many fires start while people are in bed, this is definitely a great trait to have if you’re worried about having a flammable mattress. The aesthetic design of the cover is quite basic. It is white and lined with seams all around. Now that you understand the unique materials that the mattress is made out of, it’s time to take a look at how the mattress feels. Comfort is typically the number one priority of individuals who are seeking a foam or latex mattress. The problem is that support is just as important with these forms of mattresses, as there are no springs or coils to provide resistance. There are actually three different support versions of the Sleep On Latex mattress. For the purpose of this review, we ran tests of the middle setting – we wanted to see what type of support or comfort levels were on offer with the mattress. In terms of support, the regular Sleep On Latex mattress provides about a 6.5/10. This is a great amount of support considering many competitors provide between a 5/10 and 6/10. 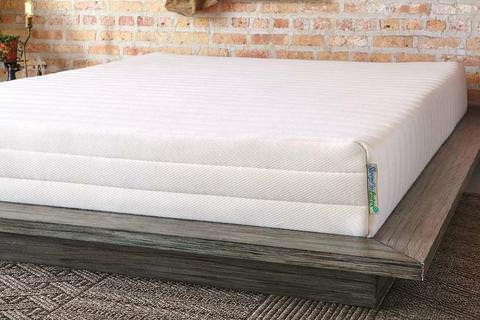 While this support level is high, we still don’t recommend this mattress if you are over 150 pounds – it won’t provide the support you need to be able to sleep on a flat surface. In addition, those who are extremely light might find this mattress applies a bit too much pressure on their backs. You may feel as though you are sleeping on top of the mattress, which can be quite uncomfortable – you don’t purchase a foam or latex mattress to not sink in a little bit. If you do happen to be a heavy or light sleeper, don’t worry, as mentioned previously there are two other settings of the same mattress you can purchase. One is firmer than the original Sleep On Latex, and one is softer. If you’re looking for bounce in the mattress that you purchase, this is probably not the right one for you. The latex absorbs pretty much all motion that occurs on the bed – you won’t find much bounce at all. On the plus side, this also means that other areas of the mattress are unaffected by motion. If you happen to be a light sleeper who has a restless partner, this mattress is a good choice – their movement won’t impact your side of the bed. All in all, the mattress is both comfortable and supportive. It is more breathable than your average mattress, but as mentioned previously, the cover of the mattress does result in additional heat retention. Sleep On Latex seems to have stuck to the same winning mattress design since it first introduced its signature mattress. It has been overwhelmingly popular with Latex mattress fans and has seen no reason to fix what isn’t broken. As you can see, there isn’t as much sinkage as with some of the other mattresses we review. Keep in mind that these tests were conducted with someone who has a body weight of 145 pounds, results will vary with different weights. If you’re in the market for a latex mattress, the Sleep On Latex mattress is most definitely one of the best options available. There are three different versions of the mattress, so you can pick and choose which one is most suitable for you. You’ll find that the top two versions of the mattress have an awesome level of support. The level of choice that you have with the mattress is not common within the industry. The only downside to the mattress is that it isn’t as breathable as some of its competitors. While it fairs better than you would expect, the cover does seem to be made out of materials that will trap additional heat. At the end of the day, this is an extremely affordable way to get into the latex mattress market. If you don’t like this mattress, or you think you would prefer a more traditional foam mattress, check out some of the other mattresses reviewed on our website.